The comments are contained in the latest EU draft of the transition agreement. THE EUROPEAN UNION wants the power to be able to cut the UK’s access to the EU’s single market during the post-Brexit transition, if it violates agreed rules, EU sources have said. The comments are contained in the latest EU draft of the transition agreement laid out by the European Commission, which is expected to be published later today. 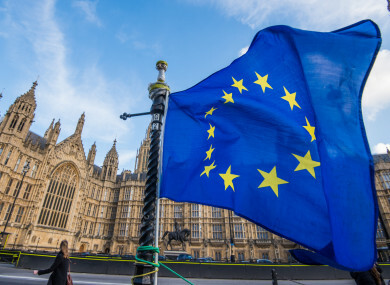 Under plans for the 21-month transition after Britain leaves the bloc on 29 March 2019, London must abide by all EU laws without having any decision-making power – turning the country into what critics call a “vassal state”. The latest EU draft of the transition agreement says the bloc should be able to cut Britain’s access to the EU’s single market if it misbehaves and if there is not likely to be enough time to take the issue to the bloc’s top court in Luxembourg. The punishment clause emerged as Brexit negotiations resumed in Brussels. Being part of the bloc’s single market will allow Britain to keep trading without tariffs or customs checks during the transition, as well as allowing British citizens to keep living and working wherever they like in the other countries. Punishments should happen “where it considers that referring the matter to the Court of Justice of the European Union would not bring in appropriate time the necessary remedies”, the source confirmed the text as saying. Britain did not say whether it would accept Brussels’ proposal, or if the government had come up with contingency plans if Britain is blocked from the single market during the transition period. “This is a draft document produced by the EU that simply reflects their stated directives,” a Brexit ministry spokesman told AFP. Germany’s Brexit coordinator, Peter Ptassek, said the Commission’s draft text “provides the clarity with the economy facing Brexit needs”. “Not so much time left to get a deal on this in March,” he wrote, referring to the month-end deadline given by the EU and Britain to conclude talks on the transition. The two sides reached an interim deal in December on three key separation issues – the financial settlement, the Irish border and the rights of EU citizens after Brexit. This week’s technical talks in Brussels will look at plans for the 21-month transition, while the issue of the border between Northern Ireland the Republic of Ireland will also be revisited. After reaching agreement on the transition period, Britain and the EU will move on to talks about their future relationship including a possible trade deal. Email “EU seeking power to restrict UK access to single market post-Brexit if it violates agreed rules”. Feedback on “EU seeking power to restrict UK access to single market post-Brexit if it violates agreed rules”.